The people in line groaned. Some muttered about having to go stay with some nosy relatives they were hoping to avoid. The inn keeper rubbed his eyes, holding in a yawn. It had been a long day, what with checking in all these visitors. They had been coming in all week, none wanting to be far from their hometown when Caesar’s deadline arrived. Everyone under Rome’s jurisdiction had to return to their hometowns to be registered, per the imperial order. They would need a place to stay, and that meant big business for people like him. He had even cleared the storage rooms to make more bedding space. Bethlehem had not seen this large a crowd in years, But now, he was surprised how many claimed the town as theirs. Now, the last of the spaces had been taken, and even the lobby was full of people lying on their robes on the bare floor. It had been a good day for business. He called for his servant as he prepared to close for the day. “You and every other person,” someone yelled. “No, no, wait. It’s m-my wife, she’s with child. She’ll soon be in labour.” The accent was probably Galilean. The innkeeper had gotten used to distinguishing these accents over the past few days. “Like I said, there is no space. You could try other inns. I could get Oved to show you a suitable one.” Oved, his servant, hurried over. His reddened eyes showed his need for rest as well. As soon as some of these guests registered with the government tomorrow, they would leave, more space would be available and work would continue. The sooner they got rid of this man the better. The Galilean stared back out the doorway. “The other inns were closed. You’re my only hope right now. I’ll pay anything.” He was already reaching into his bag. Oved stepped in before the frantic father-to-be could respond. “Perhaps we should discuss it outside.” He also knew there was nothing he could do to help, but he needed to at least let him down easy. He stole a glance at his master as he tried to lead the Galilean toward the door. A cry rang out from outside, drawing stares. The Galilean hurried out the door, Oved on his tail. The inn keeper was closing his desk when his servant peeked in at him through the doorway, concern etched on his face. 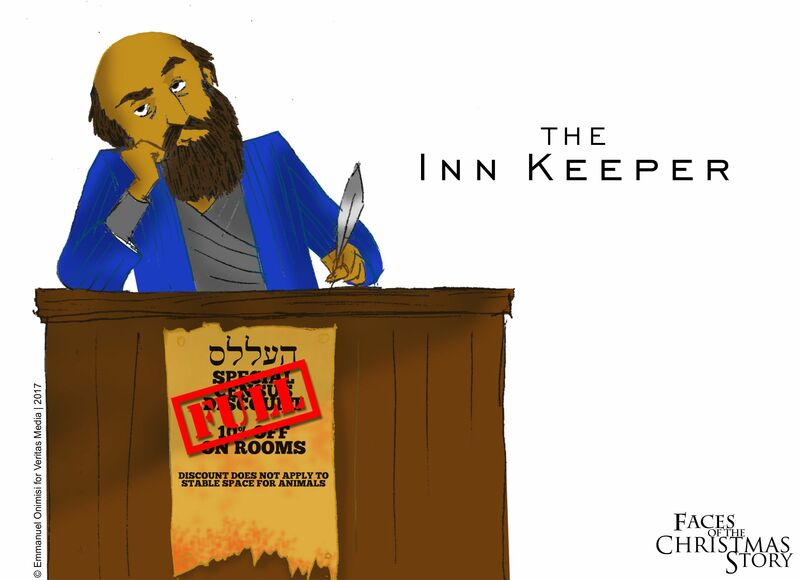 The inn keeper sighed as he stomped over, making a mental note to remind Oved that this was a business, not charity. Sure enough, the Galilean sat holding his young wife by the doorway as she moaned. Oved still stared at his master with pleading eyes, but the inn keeper refused to budge. “She needs help!” the Galilean cried. And with that he went in and took the stairs. What a day. A good night’s rest was what he needed. Making his way past the lying bodies, he walked into his room on the corner of the roof where it always had been. His bed still sat in the middle, stately and rough. If Kezia was still around it would have been neater and he would have eaten a decent meal. Kezia. Anytime he turned in for the night, the mostly empty room reminded him of her death last summer. He fell onto his bed and groaned. A thought popped in his head, of how this would have been a perfect place for a woman in labor to give birth. But just as swiftly, he shoved the thought as he plunged into dreamland. He had just about enough space for others and he had rented it out, but this was his room. His only lasting memory of her. There was no way he was going to lease it to some strangers. This was their bed. His bed. While this is fiction, I really don’t blame the inn keeper. The real one, anyway. He really did not have any more room, so he let them use the animal stable. He had no way of knowing that the Son of God was about to be born as a man, and he had just let Him be born in an animal outhouse. If He had known, what do you think he might have done differently? He possibly would have herded the occupants of the best suite in his inn out the door and refurbished it to the best of tastes. He would have brought them to his own room, deeming it fit to sleep by the door than to let God’s Son be born in his stable. He would have made room because God was coming to his house. But he did not know. Even today, it is easy to miss out on God’s gift because of how ordinary it may look. God’s help may come to us in the form of a person, or an idea, or even a message sent to us. All of that was encapsulated in the Word, God that became flesh, and many still do not know the Person born that day and what He came to do for us. Sometimes we may be like the Inn Keeper of the story. For the right reasons, our hearts might be filled with a lot of things. Thoughts on how to pay the mortgage, plans for the next year, decisions to be made. All important things of our lives that we need to organise and plan. Sometimes, what fills our hearts are pain and hurts that we find hard to let go of. Memories of times we were cheated, memories of times we were wronged, memories of times we made mistakes, memories of times we treated others unfair. Naturally, these memories shape who we become and how we think, for better or worse. A lady who has been cheated may find it hard to trust in another man. A person who failed an exam may find it hard to believe that he/she can ace it the next time. A man may hold on to the memories of lost loved ones at the expense of the comfort and healing the rest of his family and friends are willing to offer. Subconsciously, we hold on to these things believing that we have a right to them. They are our memories, a piece of our identity. In the midst of all this, God wants to have room in our hearts, and we just don’t see how that could work. But the truth is that we really do have room for Him. We just don’t realise it. He knocks on the door of our hearts and, if we let Him, He will help us clean house. Baggage we have carried with us for so long, he will carry out. Burdens that have driven us to the ground, he will lift off because He cares for us. With Him as our priority, He helps us to properly prioritise. He gives us wisdom in our daily living and endeavors. The thing is that, many times, we feel we have to make room before He can come in and, in a sense, that is true. But the only way we make room is by actually opening the door and letting Him come in. We cannot deal with the mess by ourselves. He sees the mess, and only He can take it out. Trust Him with all of it. He can handle it. He will amaze you and comfort you as he turns what was a hurtful memory into a testimony of His faithfulness. He will build you up and enrich your heart so that you can actually think about others, for good. Soon you will find yourself comforting others in need too, as He has comforted you. Like an inn keeper making room for others to find rest. But first, we must make room for Him, so that we also will find the rest we need. Christmas reminds us that Christ came so that we can find rest for our souls in Him. Make room for Him to do what He will in your life. He gives healing, and fullness, and joy. And with His love abound in us, we too can make room for others. Give someone a gift, send someone an encouraging message, tell someone the Good News of God’s salvation, be willing to listen.